M.E.D: I know mine (it’s non-existent), do you know yours? Why is your M.E.D important? This little acronym should change the way that you think about sunscreen. M.E.D stands for Minimal Erythemal Dosage. Breaking it down, what is means is the minimum amount of sun your skin can be exposed to before it becomes red (or swollen). Basically, the amount of time that it takes for your skin to start to burn. Everyone has a different minimal erythemal dosage, it will be different in just about every kind of skin, depending on how tanned you are (as this is your natural resistance to the sun – tanned cells take longer to burn). Darker skins will have a longer M.E.D range, where white skins will have almost non-existent M.E.D (I am translucent white, so this is why I fit into the non-existent end of the spectrum). So, we know that your minimal erythemal dosage is the amount of time it takes when you walk out into the sun with no sunscreen and start to burn. It’s not something that I suggest you go and start counting, it’s probably best to make an educated guess about your own skin – don’t go burning it to find out! What does this mean when it comes to sunscreen, then? The SPF or Sun Protection Factor in sunscreen is based on your M.E.D. Almost entirely. What the SPF in sunscreen does, it lengthens your skin’s M.E.D time. The number in the Sun Protection Factor is the amount by which it increases your skin’s M.E.D. So, say for example it takes you 5 minutes in the sun with no sunscreen before you start burning. An SPF 30 + sunscreen would increase that amount of time by 30 times. So, with the correct amount of sunscreen applied, your skin will be protected for up to two and a half hours. One thing that you might not realise, is that despite the fact you are protected for up to two and a half hours, essentially you are not completely protected. If you remember, the M.E.D is the point that your skin begins to burn. So when you have reached that two and a half hour point, your skin is starting to burn. Another thing that you might not realise, is that reapplying does not change or extend the amount of time that you were first covered for. Putting on another layer of sunscreen does not give you another two and a half hours. It’s still very important to reapply, but the reason actually is to ensure that you get the full two and a half hours protection from your first sunscreen application. Once you have reached that first time limit, your skin needs to recover, before it starts to burn. It takes 24 hours to reset itself – this is when you can start counting your SPF again and safely go out in the sun without risk of burning. 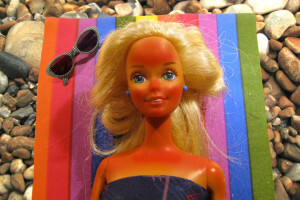 It’s important to know, especially because sun damage doesn’t go away. It might not be noticed for a while, even years, but it doesn’t lessen over time, it continually builds up, each time you get burnt it adds to the pile and grows in the deep layers of the skin, increasing your risk of deadly skin cancer, and not-so-deadly but very hard to manage skin conditions like pigmentation and premature ageing.